Brain wiring is as unique as our individual experiences. These are physical brain changes in the actual brain. We seem to need “emotional hooks” to provide breaks for our brains every 10 minutes or so. “People usually forget 90% of what they learn in a class within 30 days.” Most of this occurs within the first few hours after class. You can increase the life span of a memory by repeating the information in timed intervals. The more elaborately we encode information at the moment of learning, the stronger the memory. The trick for communicators is to do this in such a way that hearers do this on their own. Information is remembered best when it is elaborate, meaningful, and contextual. This is why examples are so powerful. Introductions are everything. The first time something happens it has disproportionate power to be memorable. Working memory’s three-component model – auditory, visual, and executive. Our long term memory of events can be very inaccurate on the details. 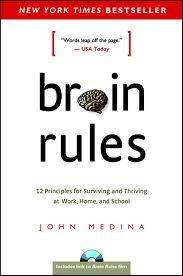 “The typical human brain can hold about seven pieces of information for less than 30 seconds!” Re-exposure is key to long term memory. Intervaled repetition of knowledge helps recall and learning. Exposure yourself to information “more elaborately” for higher quality retrieval. Best recall practice >> Fixed elaborate intervals of exposure to information. It can take years (as many as 11!) for long term memory to solidify (hippocampus letting go of its cortical relationship). Our memory is unstable until solidified. Long term remembrances reenact our original patterns during the first moments of learning. Forgetting allows us to prioritize events. Medina suggests restructuring school to favor intervaled recall both in the short and long term. Sleep is intimately related with cognitive performance. Without sleep, anyone will go into psychosis. Brain activity is greater than during waking state during REM. Scientists don’t exactly know what sleep is for. The basic pattern we need is 16 hours consciously awake to 8 hours asleep. Two systems seem to be at “war” with one another – one trying to keep you awake, another asleep. Everyone seems to need a 30 minute nap sometime in the early afternoon – it is part of our natural cycle. Obliquitous insights can often come to us after “sleeping on it” as they did for Mendeleyev and periodic tables. We replay daily patterns at an accelerated rate during our sleep. In situations of extreme, continued stress, we tend towards “learned helplessness,” preventing us from seeing options. Our stress response is shaped to incidents that last a few minutes, not years. Our brain puts together a single approximation of what our two eyes see. Creating vision in the brain takes up about half of the total power our brain uses. Usually, movement is better than still images. Many of the 1500 genes on X chromosome involve brain function. The right brain tends to remember the gist, while the left tends to remember details. Boys tend to cooperate through competition. It is impossible to declare these differences to be wholly or even mostly biological. Math and science may lend themselves to rewarding competitive tendencies with more objective “right answers,” whereas language arts may lend themselves to more cooperative, “me too” discussion of feelings that reward cooperative tendencies.